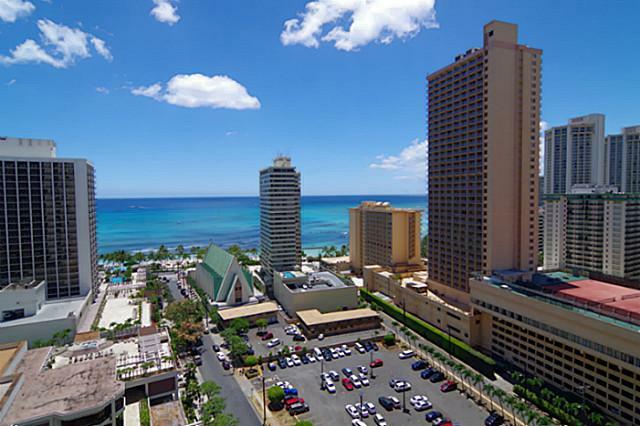 A great end unit with amazing views of the ocean, the marina, Diamond Head and the mountains has just become available in the highly sought after Waikiki Banyan building on Ohua Ave. This 1- bedroom, 1 bathroom unit offers over 500 square feet of living space and is perfect for a one the go professional who works in the Honolulu/Waikiki area of Oahu. With plenty of amenities and great views, this listing isn’t to be missed. Located in the Waikiki Banyan high-rise building, this unit is also on the 22nd floor, which will put you above everything in the city and allow you to enjoy the peace and quiet you deserve after a long day’s work. There are some notes to take when thinking about viewing and/or purchasing this unit. There is new carpet and vinyl tiles in the unit, and new paint and furniture fixtures will be put in before the end of August. The unit is priced to sell. There is a Becker sandwich lease till 2035 and current amount is $22/month. This can be purchased for Approx. $10,000 (Please verify with Becker). The unit is a great unit for the working professional as is only one block away from great dining and shopping. The building comes complete with plenty of amenities as well, as you are getting the entire package for a great price in a great building. If you have been dreaming of living in a high-rise building in Honolulu then this is your chance. Affordably priced with all the amenities, the end unit in the Waikiki Banyan may be exactly what you are looking for. Take a few minutes to view this listing and many others like it, you are only minutes away from exploring great condo opportunities in Honolulu. View this listing and others Waikiki Condos now!